In a world where swagger usually triumphs over substance, its refreshing when a young singer/songwriter arrives on the scene with something to say. With the multi-faceted sound of a much older soul and shimmering melodies that match the intensity of his heartfelt lyrics, 21-year-old Phil Wickhams self-titled debut cant help but stand out in a crowd of cookie-cutter pop and angst-fueled rock. And its his personal journey of faith expressed in the songs that really makes the difference. 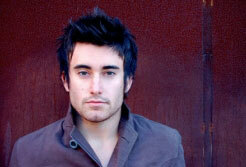 Even though singer/songwriter Phil Wickham grew up in a devout Christian home, there came a point early in his life when he knew his faith needed to become his own. He no longer wanted to coast on his parents coattails or go to church simply because thats what he was supposed to do. He wanted something real, that personal friendship with Jesus. And that crucial realization, combined with moving to a new city while he was in junior high, paved the way for Phil to pick up a guitar and start writing songs about his growing faith. While difficult at times, the transition from Orange County to San Diego proved to be fruitful. It was a good time of reflecting, writing songs and playing guitar. And once he picked up that guitar, it wasnt long before his junior high youth pastor took notice and asked him if he wanted to lead worship. A little reluctant at first, Phil accepted his pastors invitation. When I started leading worship when I was 12, the Lord just really started blessing it with the junior high group, Phil says. Kids were singing, and I found that I really loved doing it. Phils father, a worship leader and veteran of Jesus Movement bands including The Way and Parable, also encouraged his sons emerging talent by challenging him to learn to play hundreds of popular praise songs and to write his own in the meantime. And before long, people whod heard Phil play his songs asked him when he planned to release a CD. I was like Are you kidding me? No way, Phil recalls. Then the Lord just brought different people in my life to show me what it means to minister, what it means to lead worshipjust the transparency of self and coming forward in faith and knowing that the Lord is there. There were awesome lessons that I was going to use the rest of my life. And when I finally had in the neighborhood of 20 songs, my Dad was like You should record a CD. Still a little skeptical on how everything would turn out, Phil recorded his first independent disc, Give You My World in a small home studio. After a great response to the disc, Phil says, I knew this just had to be the Lord. So I started playing a lot more places in California, a lot of Calvary Chapels out there. And I kept writing, kept on playinggoing to school, and eventually to college. I didnt even know at this time that this was what I wanted to do with my life. I was open to anything. But after a period of time where he was desperate to hear from the Lord about his next steps career-wise, he finally began to feel peace about his future. I felt like I needed to be in a place where I could just wait on Him, and He could just show me what to do, Phil says. And it took some searching to get to that placeI pretty much spent a whole night on my knees because there were just so many things involved. And it wasnt long after that when his lifes direction became clear. With his music skills attracting the attention of several record labels, Phil had an important decision to make, one that eventually led him to sign with Simple Records, the boutique label that MercyMe frontman Bart Millard and producer Pete Kipley started together. After Bart and I first heard Phils music, we knew right away that he would be perfect for what we are trying to accomplish as a label, Pete says. The depth and the beauty of his songs are equally matched with a voice you can never forget. And that captivating voice expresses a wide spectrum of emotions on his Simple Records debut, from the atmospheric strains of Grace to the soaring guitar anthem, Mystery, Phils music shimmers with pop/rock sensibility, innovative melodies and a heart for worship, the very place where it all began. Every song on the record is an adventure, which made making the record an unforgettable experience, Kipley says. Phil has such an incredible sense of melody, lyrics that read like poetry, and I believe the listener will leave with feelings of the greatness of God, and at the same time the desire for God to have an intimate relationship with us.